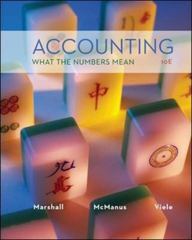 Accounting: What the Numbers Mean 10 Edition Accounting has become known as the language of business. This new edition is written to meet the needs of those students who will not be accountants but who do need to understand accounting to learn the key language that embarks us in the business world. Marshall, the leading text in the Survey market, takes readers through the basics: what accounting information is, what it means, and how it is used. The authors help students succeed through clear and concise writing, a conceptual focus and unparalleled technology support. In using this text, students examine financial statements and discover what they do and do not communicate. This enables them to gain the crucial decision-making and problem-solving skills they need in order to succeed in a professional environment.